National Geographic’s ultimate resource for traveling with your furry friend features hundreds of dog-friendly places to pamper your pooch, from doggie daycare to canine cruises. Special features include walks you can take with your dog, insider tips from local pet parents on how to best enjoy their area with a pup, and sidebars detailing unique opportunities for coddled canines, such as winery hikes in California wine country. 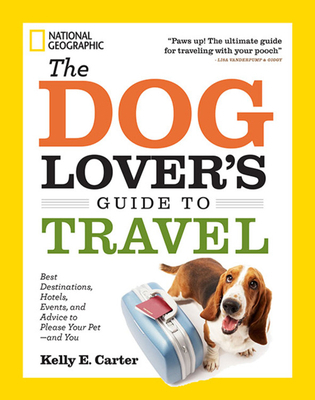 New York Times bestselling author and pet parent Kelly E. Carter, and her beloved longhaired Chihuahua, Lucy, give you the inside scoop on pet-friendly hotels and restaurants, beaches, parks, and dog runs, plus the lowdown on events for four-legged visitors and dog-friendly attractions. A detailed introduction discussed everything you need to know when taking your pooch on vacation, including the lay of the land for road tripping and flying cross-country. From Sanibel Island, FL, to Whistler, BC, from Montreal QC, and Nantucket, MA to San Francisco, CA, The Dog Lover’s Guide to Travel showcases 75 of the best pet-friendly vacation destinations across the U.S. and Canada. KELLY E. CARTER has spent more than a decade traveling around the world with her beloved longhair Chihuahua, Lucy. She founded TheJetSetPets.com, a resource for people who travel with their pets. A popular speaker at travel conferences, Carter is also the pet travel expert for AOL's pet site PawNation and Elite Traveler, where she’s a Contributing Editor. She has written for numerous publications and websites, including on staff for People and USA Today and as a freelancer for Departures, Men's Fitness, Black Enterprise, Los Angeles Times, Chicago Sun-Times, History Channel Magazine, South China Morning Post in Hong Kong, Essence.com, Brides.com, TownandCountryTravelMag.com, CigarAficionado.com, and AOL's StyleList.com and BlackVoices.com. With Venus Williams, Carter co-authored the New York Times best-selling book Come to Win: Business Leaders, Artists, Doctors and Other Visionaries on How Sports Can Help You Top Your Profession.